This increasingly popular Feedback section is now going over onto a second page, as you can see. Even though this is not meant to be a science discussion forum (for that, try our new TJ), we will now have more latitude, so we can occasionally publish an enquiry complete with a 'teaching' answer from time to time. The last issue was extremely well-received in all aspects, and we continue to be gratified at the flood of positive comments, especially testimonies of its salvation effectiveness. We only ever publish a small proportion of such 'pat on the back' comments each time. Sometimes praise is mingled with a desire to help others. For instance, Graeme Bisseker from Canterbury, New Zealand, wrote about the need for parents to monitor more than just 'television, magazines and the internet'. Recently, he was shocked at the blatantly evolutionary statements in some Reader's Digest educational books he had bought for his children. 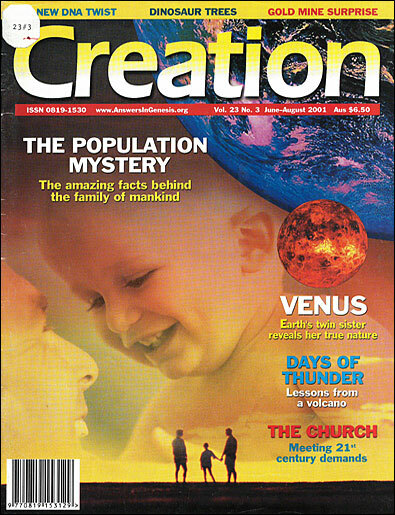 He says that Creation magazine not only teaches his children, but heightens his awareness of anti-Christian influences in all manner of things regarding science and education. Perhaps so that we might not let all the positives turn our heads, this issue requires us to print more than the usual number of corrections and clarifications. This is partly because some matters date back as far as 1998. Our rate of editorial corrections still seems low compared to the secular 'average'. But it's always good for all of us, readers included, to be reminded that we're as fallen and fallible as anyone else; it's only God's Word that's infallible. 'The Darwin-Trotsky Connection' (23(2):54-­55) stated that the Ukrainian anarchist leader Nestor Makhno had been killed by Trotsky. Mr Yakov Krotov of Moscow, Russia, pointed out that this was not so. The author, Barry Woolley, obtained his information from academic sources. But on further checking he agrees with our correspondent. Despite Makhno having survived several assassination attempts by the Bolsheviks acting on Trotsky's orders, he died in Paris of other causes. Thanks, Yakov. An error slipped past our checkers in 23(2):19, where it was stated that Kevlar was '10% stronger than steel by weight'. In fact, it is 10 times stronger. Spider silk, incidentally, is much stronger still. When our 1998 article 'The Mystery of Ancient Man' (20(2):10-­14) was published on the Web recently, a sharp-eyed US reader (wishing to remain anonymous) noticed a problem. On p. 13 the article referred to the orbit of Venus as 584 (583.92) days, when the reader's sources said it was less than half of this. The article should have clarified that this (correct) figure refers to the synodical period i.e. the time it takes for Venus and the Earth to 'line up' relative to the Sun again, something which is apparent from the Earth's vantage point. The sidereal period, i.e. the period of rotation relative to the stellar background, is indeed only 225 (224.7) days (see our Venus article this issue).